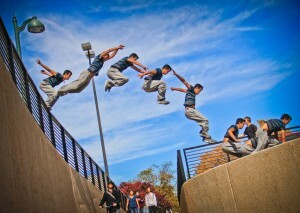 Kyle ‘Epic’ Mendoza is a WFPF athlete that has been active in the parkour and freerunning scene for a long time. Well known for his philosophical viewpoint on his training, love it or hate it, he’s definitely a character. We collected a few of our favourite photos by and featuring Kyle for you here. It’s so interesting to see how different athletes capture and present movement. Would you be interested in us showing more ‘athlete-made’ photography? Leave us a comment! And you can also check out FLOW’s recent little bytes video of some of Kyle too. Enjoy!